De R, Bush WS, Moore JH,. Genome-wide association studies (GWAS) are a powerful tool for investigators to examine the human genome to detect genetic risk factors, reveal the genetic architecture of diseases and open up new opportunities for treatment and prevention. However, despite its successes, GWAS have not been able to identify genetic loci that are effective classifiers of disease, limiting their value for genetic testing. This chapter highlights the challenges that lie ahead for GWAS in better identifying disease risk predictors, and how we may address them. 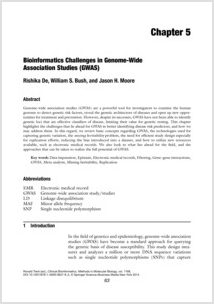 In this regard, we review basic concepts regarding GWAS, the technologies used for capturing genetic variation, the missing heritability problem, the need for efficient study design especially for replication efforts, reducing the bias introduced into a dataset, and how to utilize new resources available, such as electronic medical records. We also look to what lies ahead for the field, and the approaches that can be taken to realize the full potential of GWAS. 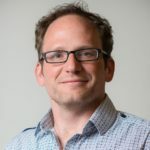 Posted in Publications, Will Bush and tagged Computational Biology, Genome, Human, Genome-Wide Association Study, Humans.